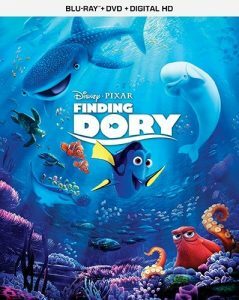 You are here: Home / Media Reviews / Just Keep Swimming – Finding Dory, Now on DVD/Blu-Ray/Digital HD is Fun for the Whole Family! I love this Blu-ray DVD Combo because of its many features which are interesting and funny. My favorite one was called, “The Octopus That Nearly Broke Pixar”, this talks about how Hank was the most difficult Pixar character to create because it didn’t have the same formula as other Disney characters. They also explain how Hank took 2 ½ years to make, which is a long time since it usually takes 9 months to create a character. I also like how it shows and gives an explanation of why the deleted scenes didn’t make the final cut. I give this Blu-ray DVD Combo of Finding Dory, 5 out of 5 amazing stars. I recommend this to kids ages 5 to 18 and I think adults might like this as well. I also recommend this to people who like action, adventure, animation, comedy, and family movies. Make sure to buy this Blu-ray DVD Combo coming out to a store near you. You can find it on DVD/Blu-ray/Digital HD on November 15, 2016. 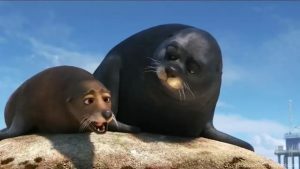 This movie is rated PG but I think younger kids will love the septopus, the seals, the beluga whale and all the new quirky characters. Some of the content is sad and serious and might worry a younger audience if they are sensitive. Just remind them you will always be there and you will never forget them. I give this film 4 ½ out of 5 starfish.